Weather and climate analyst Schneefan here writes of “early frost” in the Arctic and how Greenland snow and ice have grown after being hit by a “snow bomb”. This contradicts the expectations of global warming alarmists. The polar summer this year appears to have ended prematurely. 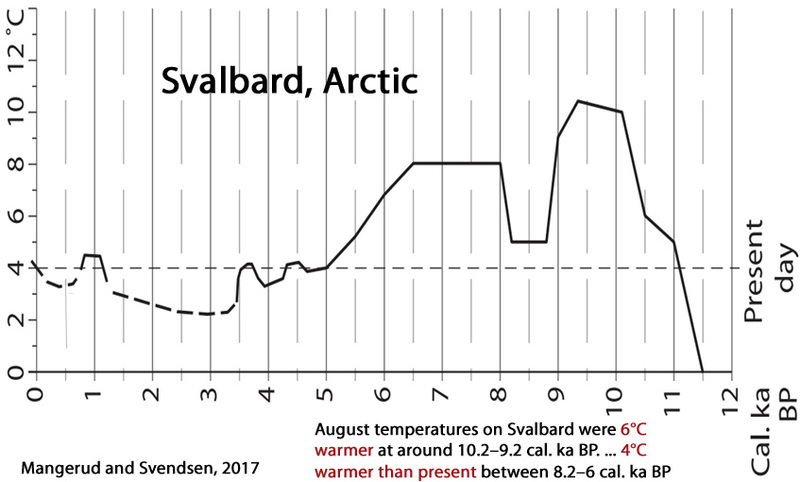 The mean temperature of the central Arctic above 80°N has remained under the long-term average over the entire summer and even dipped below the freezing point about a week earlier than normal (1958-2002 mean). An unusually early and massive snowfall in northwest Greenland led to a record high surface snow and ice mass budget, despite the summer melt season. In one single day, 14 August 2017, the ice and snow grew by a whopping 6 billion tonnes. 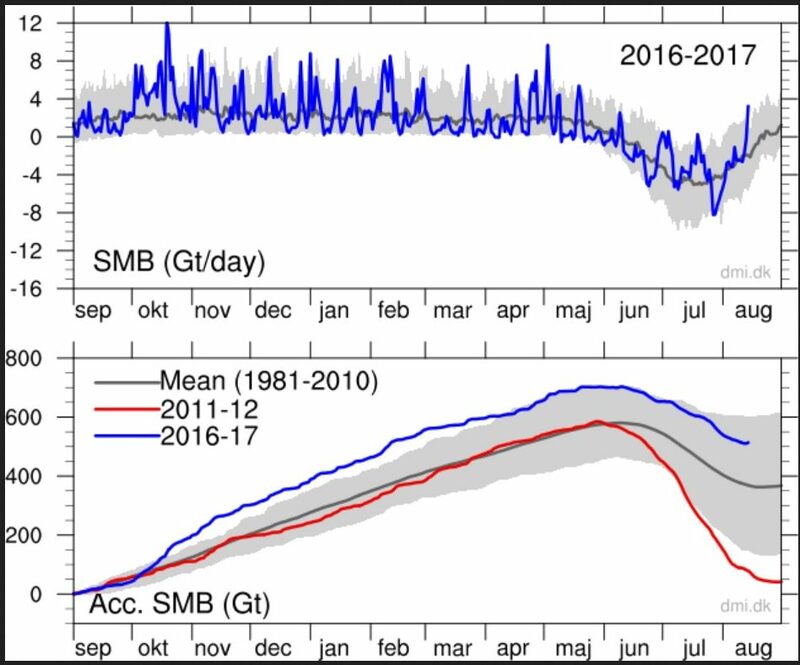 The following DMI Greenland snow and ice mass budget chart clearly shows the “snow bomb” as the blue curve spikes sharply upwards. Such a spike has never been seen for this time of the year. The upper DMI chart above shows the daily ice growth/loss since 1 September 2016 until 14 August 2017 in billions of tonnes. The lower chart shows the accumulated surface mass balance. Source www.dmi.dk/greenland-surface-mass-budget/. 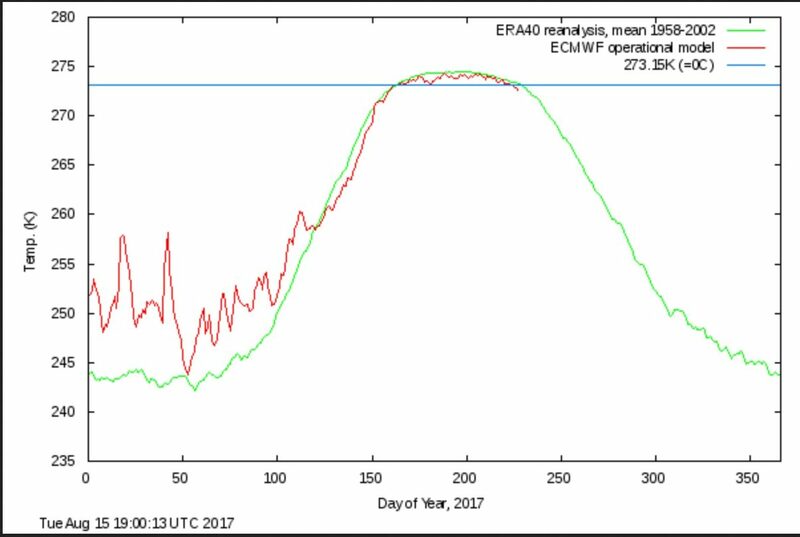 Note the latest small step upward in the lower chart, which is unusual in August because it is supposed to be the melt season. The approximately 670 billion tonnes of accumulated ice mass reached last May is new record. Note that this year is some 450 billion tonnes of ice above the level of this time in 2012 (red curve). The weather forecast for Hall Land in northern Greenland forecasts more snow on the way, after a few days of above freezing weather. The Central Arctic sea ice extent this August is considerably greater than it was over the past years. Arctic ice volume (chart, upper right) currently is within the normal range of the past years. Globally especially the southern hemisphere 2m temperature anomaly has been in a free fall, as the following chart with 1 week projection illustrates. Overall, the recent early cold conditions in the Arctic of course are weather, but is weather that was not expected by many. In general the Arctic has shown unanticipated stability over the past 10 years. That’s been a real surprise to a number of global warming scientists. 1) “even dipped below the freezing point about a week earlier than normal” – it does that in many years. That hasn’t been an indication of how much ice will melt this time. 3) “Note that this year is some 450 billion tonnes of ice above the level of this time in 2012 (red curve).” – you make it sound like that number is the actual increase in ice mass since 2012. It is not and I hope you know that. 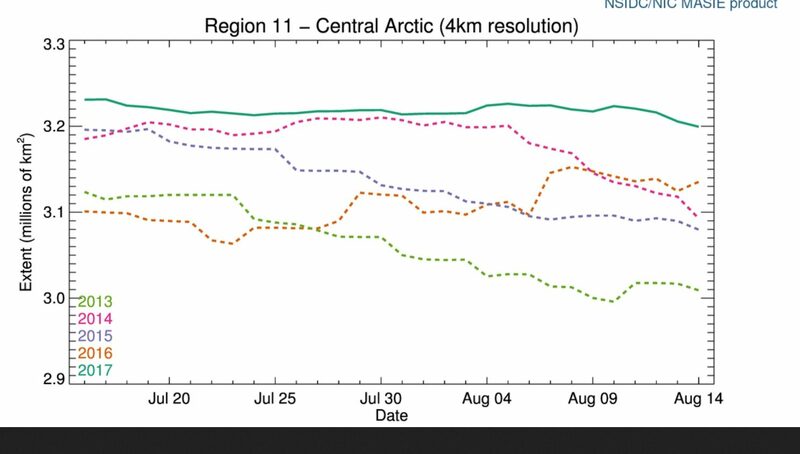 4) “The Central Arctic sea ice extent this August is considerably greater than it was over the past years.” – why not show the graph for the complete northern hemisphere? Or something like this? http://nsidc.org/arcticseaicenews/charctic-interactive-sea-ice-graph/ … ice extent is very close to the 2012 low level and currently lower than 2016 (that links also has the Antartic sea ice extent for you, also much lower than 2016). 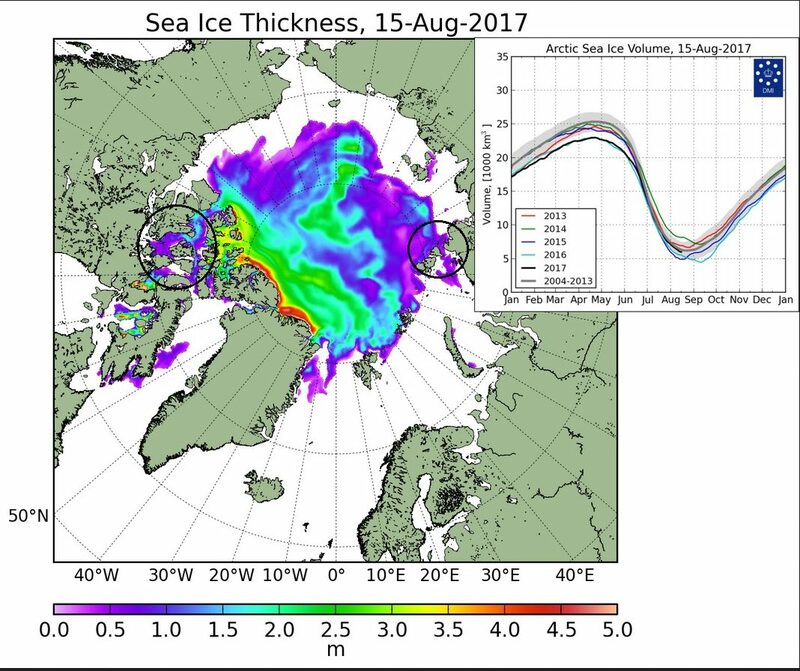 5) “In general the Arctic has shown unanticipated stability over the past 10 years.” – are you sure? 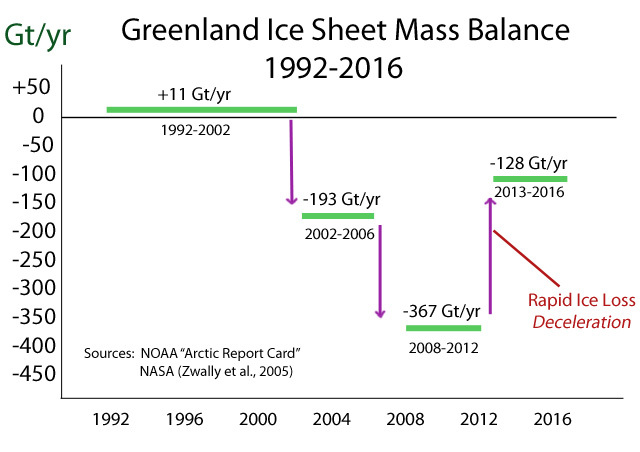 https://climate.nasa.gov/vital-signs/land-ice/ stability looks different than those graphs. See what you are doing here? You make the data appear to mean something that it does not. “Disinformer” is the right term for that behavior. SebastianH, why do you feel the need to try to misinform the public about the latest climate science like this? You know what the science says (you’ve read these scientific papers before, as presented here), and yet you ignore them and post your own version of the “truth”. Again, why do that? The Arctic was sea ice free during summers earlier in the Holocene too, when, again, CO2 levels were 150 ppm lower than they are now. Finally, you know that just last week there was a summarizing article here indicating that the latest scientific papers have told us there has been a dramatic deceleration of Greenland Ice Sheet melt contribution to sea level rise since the 1920s and 1930s. 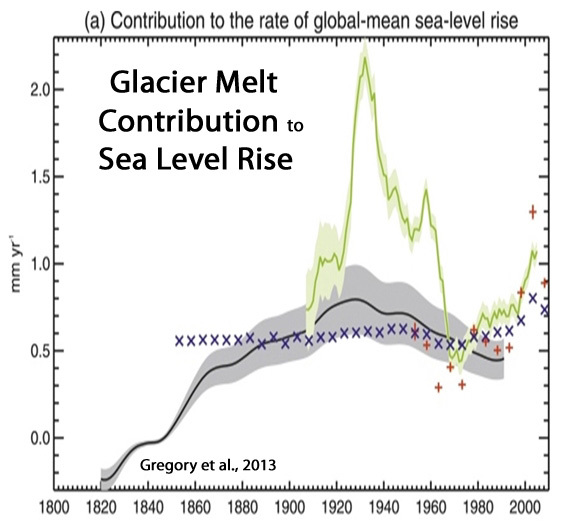 After zero Greenland Ice Sheet melt contribution to sea level rise for the 60 years between 1940 and 2000 (when human CO2 emissions exploded), there has been just a 0.39 of a centimeter contribution to sea levels from GIS melt during the years between 1993 and 2010. This was after there was a 1.1 cm contribution during the 1920s and 1930s, hence the deceleration. All together, the Greenland Ice Sheet has contributed just 1.5 cm to sea level rise in the last 110 years, with 1.1 cm of that occurring before 1940. With all the latest in scientific research (that you are obviously aware of), can you explain why it is you felt the need to ignore this science and post your “alternative facts”? What do we call someone who regularly tries to misinform the public, SebastianH? Why are you so obsessed with the past, Kenneth? As if that would establish that the same cause is at work today. Is that the goal of these exercises? For all those Greenland 10000 years graphs I suggest you find out what year the most recent data point marks and compare the observed temperature change from around that time until today. Let’s see … 1) is easily checked and you’ll find it’s true, 2) is just a notification of a typing error, 3) notifies the author that he is implying something that the data doesn’t say and that he should make it clearer, so nobody would think that the ice mass actually gained billion of tonnes since 2012, in 4) the use of just the central Arctic area graphs instead of the complete Arctic ice extent is questioned and in 5) the claim of stability is questioned, because the ice mass has not at all been stable in the past decade. How are these “alternative facts” as you put it? So noting that Greenland has cooled since 2005, that there has been no net warming on Greenland for the last 90 years, that the sea level rise contribution from the Greenland ice sheet has been 0.39 of a cm since 1940 (a considerable deceleration from the 1920s-1930s period, and zero contribution between 1940 and 2000)…all show an “obsession with the past”? The 20th century isn’t recent enough? This is such a weak “rebuttal”, SebastianH. Those were only a small part of my response. But since I assume you are not happy that scientists have pointed out that the Arctic was 3 to 5 degrees C warmer than now for most of the Holocene, when CO2 levels were well under 300 ppm, please specifically identify the mechanism that was working in the past to cause such warming…since it wasn’t CO2. And why hasn’t CO2 been able to supersede that mechanism, whatever it is? Please be specific with describing the mechanism. Whenever I ask you to identify the mechanism that caused Arctic warming in the past, you evade. See if you can answer directly this time. Well, it’s been cooling slightly in the last decade – along with the entire North Atlantic. So I guess if you want to call a slight cooling “not at all stable”, that’s your call. We’ll stick to the scientific literature. You go ahead and keep on posting your made-up graphs…and graphs from NASA. So no “alternative facts” then … great. I am sure whatever paper you found that in has an explanation for the warming. How do you explain the loss of ice mass despite the cooling, Kenneth? Any suggestions? Are the satellites fake? Is the method of measuring it fake? Or is the data itself manipulated? What is it this time? Lots of factors operate in cycles. It can cool, and yet melting can occur due to other underlying cycles in their warm phase. I want to know from you what you think is the mechanism that caused past warming. I already have extensive scientific evidence to support my viewpoints. I’m not asking you for information. I’m asking you to identify what you think the mechanism or mechanisms is/are causing the Arctic to be so much warmer than now in the past, or as recently as the 1920s-1930s. Why do you invariably refuse to answer this question? Is it that you can’t bear to acknowledge that natural factors could explain modern warming? 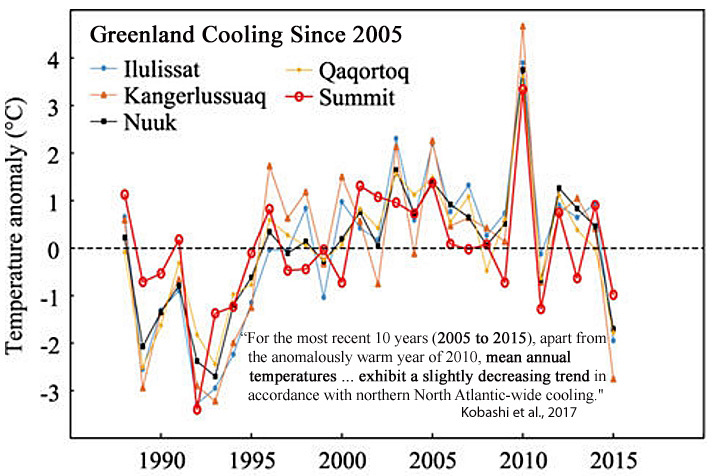 Why do you suppose that Greenland and the North Atlantic have undergone a cooling trend since the mid-2000s? What’s the mechanism? Will you ever answer these mechanism questions, or will you just keep on pretending that we don’t notice that you don’t want to acknowledge that something other than CO2 is a driver of climate? I want to know so many things from you that you never answer or care to elaborate. It always results in lots of quotes trying to support whatever you believe without understanding the problem / your mistake. Will you answer my questions when I answer yours? Or is this one of your “assignments” to distract from what the OP (me in this case) originally wrote? btw: You called what I wrote “alternative facts”. Why? If natural factors could explain modern warming you could easily list them and their relative influence. I guess you disagree with Figure 8.15 (page 697 in https://www.ipcc.ch/pdf/assessment-report/ar5/wg1/WG1AR5_Chapter08_FINAL.pdf) … why? Because it is all fake and fraudulent? Or is it because you found “evidence” in some paper that you are able to believe more because it fits your viewpoint? You called what I wrote “alternative facts”. Why? Because you claimed that the Greenland Ice Sheet has been unstable for the last decade. Scientific papers indicate otherwise, or that the GIS has been cooling since 2005. If natural factors could explain modern warming you could easily list them and their relative influence. Now see if you can answer my questions: What caused the Arctic to be 3-5 degrees warmer than now for most of the Holocene? 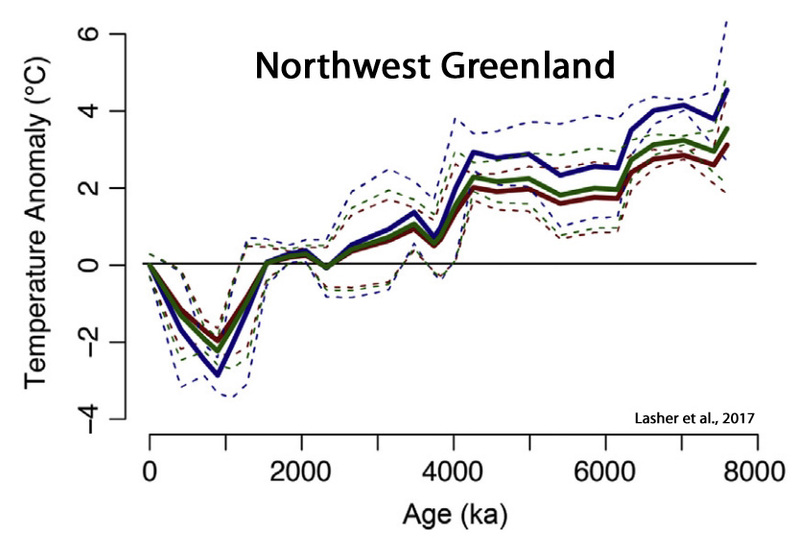 Why was the Arctic sea ice free during the summers for much of the Early Holocene? Why was the GIS 20 to 60 km behind its current extent through to about 4,000 years ago? Why did the GIS melt three times more during the 1920s-1930s than in recent decades? Why wasn’t there any sea level rise contribution from the GIS during the 1940s to 2000s…while CO2 emissions rose from 1 GtC/yr to 8 GtC/yr? What was the mechansim for all these trends? Will you ever finally identify it, or will I keep asking you and you keep on trying to evade? Do you think these data points are “alternative facts”? 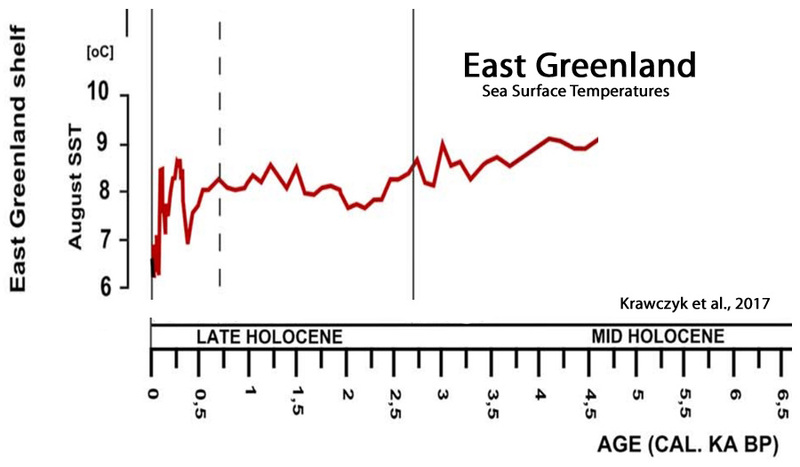 What caused the Arctic to be 3-5 degrees warmer than now for most of the Holocene? Why was the Arctic sea ice free during the summers for much of the Early Holocene? Just to make sure, what reconstruction are we talking about here? If it indeed were warmer than today in the Arctic by 3-5 degrees there could be a number of reasons. Since that would mean that the Arctic warmed more than the rest of the globe it could have been some ocean currents that transported more energy than usual up there? Obviously not human emitted CO2. Other than that, I don’t know (can’t find the paper you might be referring to here). What did cause the temperature variations and why was the Arctic temperature anomaly so much larger than for the rest of the planet? (btw: it’s also larger than the rest today). According to the Arctic Report Cards put out by NOAA, the average ice melt trends for the Arctic in recent years (-128 Gt/yr) have been trending back to above the 2002-2006 trend (-193 Gt/yr) after bottoming out between 2008-2012 (-367 Gt/yr). The 2013-2017 trend will become even closer to positive territory than -128 Gt/yr (or in balance) when adding this year’s results, as the ice sheet is likely to be in the positive for 2017 (it was only -6 Gt for 2013). 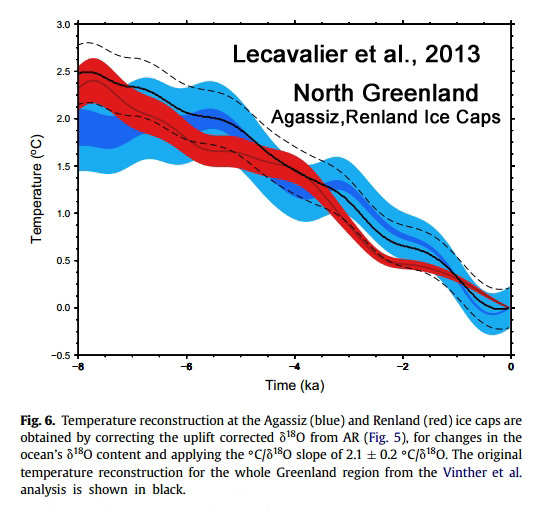 Overall, since the mid-2000s, the Greenland Ice Sheet has been quite stable. So have temperatures, with a cooling trend since 2005 for not only Greenland, but the entire North Atlantic. Do you think the Arctic Report Cards that NOAA releases every year are “alternative facts”? Because that’s where these stable trends come from. So you don’t know why the Arctic was sea ice free in summers, temperatures were multiple degrees warmer, the Greenland Ice sheet was 40 km behind its present position…earlier in the Holocene? Why don’t you know the answer to this? You can’t take a stab at it? What was the mechanism that caused the Earth to experience some of the lowest centennial-scale temperatures of the last 10,000 years during the 1450 to 1900 period? What cooled it down…since CO2 rose during that time? That’s saying the same but isn’t trying to manipulate the viewer to think that somehow Greenland’s ice mass would be stable. That’s the same data. I am using them and you called them “alternative facts”. during the 1450 to 1900 period? What cooled it down…since CO2 rose during that time? Don’t get us started with that discussion again. It will lead nowhere without you understanding how CO2 concentration and temperatures are connected when human emissions aren’t present. btw: I didn’t ask “Just to make sure, what reconstruction are we talking about here?” just for fun. I can not find a credible source that says the temperatures were higher most of the time in the last 10000 years. Is the source that Easterbrooks nonsense? So why do you think it is that the GIS lost -367 Gt of ice per year from 2008 to 2012, but since then, it’s averaged only a little over -100 Gt per year? Why the dramatic deceleration in the last 5 years, stabilizing the yearly losses to even less than what they were averaging in the mid-2000s (-193 Gt/yr)? Why is the GIS going to be showing a positive balance for 2017? What was the mechanism causing the trend to shift towards a positive balance again (like we had from 1992-2002) since 2012? Will you refuse to answer these questions again because I have asked you to identify the mechanism for the post-2012 shift? It would appear that that’s what you have been doing, especially considering the latest science indicates Greenland has been cooling since 2005. Let’s see. CO2 rose from 280 ppm to 296 ppm between the mid-15th century and 1900. That’s a radiative forcing of +0.21 W m-2 for that 450-year period. That should have caused a temperature increase, not a decrease during that period. So perhaps some other factors are at play. Can we assume that you believe that the low solar activity and high volcanic activity did not appreciably contribute to the Little Ice Age cooling, and that it was the CO2 concentration which caused the cooling (even though it should have caused warming)? You pick. There are many more. 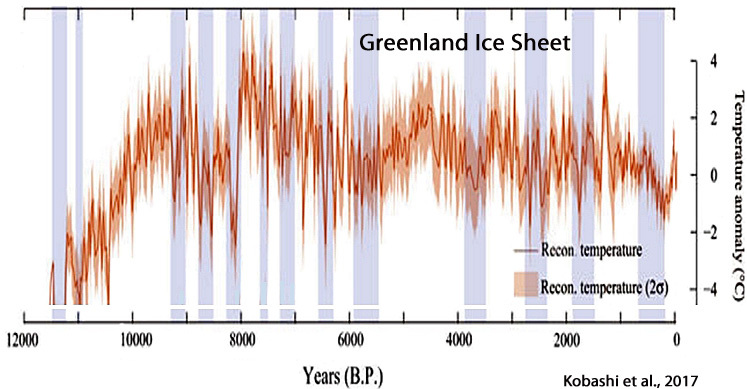 “After the 8.2 ka event, Greenland temperature reached the Holocene thermal maximum with the warmest decades occurring during the Holocene (2.9 ± 1.4 °C warmer than the recent decades) at 7960 ± 30 years B.P. … For the most recent 10 years (2005 to 2015), apart from the anomalously warm year of 2010, mean annual temperatures at the Summit exhibit a slightly decreasing trend in accordance with northern North Atlantic-wide cooling. Because, those who do not learn from the past are destined to repeat it. 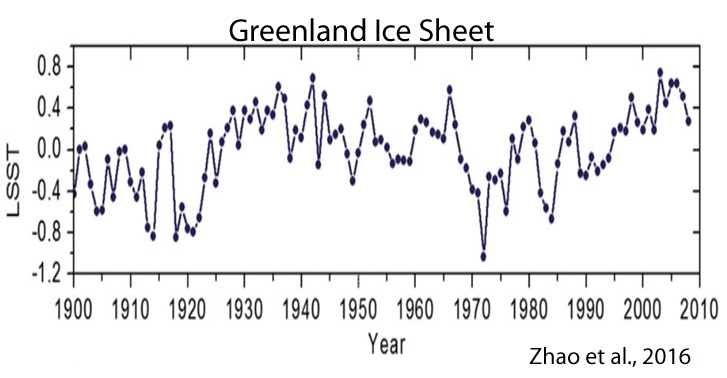 And 2005 was the only time (these past 120 years) when Greenland was warmer than it was in 1940. Greenland today, is no warmer than it was in 1940 notwithstanding that man has emitted approximately 95% of all manmade CO2 emissions since 1940.. The United States National Ice Center supports the idea that the Northern Hemispheric ice is running right along the most recent 10 year average. The seems stable to me! How can it be right if it contradicts the CO2 hypothesis? Observed data must be changed to fit the models. Give it time. Just a few months ago, DMI changed their baseline period from 1990-2013 to 1981-2010 so as to show less of a positive SMB anomaly for 2017. And its still setting growth records. So it’s only a matter of time before the data are changed again. The models can’t be wrong. Only the observations. Back in 1987, global temperature data sets showed 0.5 C of warming between 1987 and 1950. That warming didn’t fit the narrative, of course. So it was removed. Another fabrication from SebastianH, indicating he’s eager to engage in the same dishonest data manipulation as NASA. SebastianH, notice that in my graph, the starting point (1880) is in the same spot. In your fabricated graph, you make the starting point (1880) about 0.5 C lower for the 1987 graph than the 2016 graph. And then you hope that no one will notice this little “trick” of yours. I’ve informed you of this “mistake” at least 2 or 3 times before…and yet, despite knowing that you’ve started the ’87 graph data point a half a degree lower, you’ve chosen to make another attempt to misinform, hoping that it might slip past detection this time around. You have just illustrated quite effectively what your side, and you, are willing to do with data manipulation. Sorry, but why do you think that both graphs should start at the same temperature? What happens if we start from the year 1900 in both graphs and draw it the way you did it? Does the comparison change by doing that? What makes you certain that you didn’t manipulate by falsely combining both graphs? Um, because the 1880 temperature is the starting point for the instrumental record, and the starting point doesn’t change over time unless it’s been artificially manipulated. Why do you think the starting point should be a half a degree different? Could it be because you want to conceal the half a degree of erased temperature? According to NASA (1981), the NH warmed by 0.8 C between 1880 and 1940 and cooled by 0.5 C between 1940 and 1970. What happened? Why did that disappear? Someone edited my reply without making it clear. Pierre, was that you? Anyway, you didn’t understand what different baselines mean for the woodfortrees graphs and maybe you don’t even understand the concept of baselines for anomalies. I tried to make that clear to you by asking you how the graph would change if you ignored the data from before 1900 and matched both lines for that starting point. Different baselines, different results. When adjusting data you don’t generally adjust them so the starting point of your time series doesn’t change. When you figured out how to best measure temperatures after 100 years and want to adjust the records, then you’d naturally adjust other values towards your current implementation of measuring temperature and not the other way around. Wouldn’t you agree? But of course this is explained in detail in the FAQs of those services providing these temperature records. But I guess that is all fake to you anyway, right? 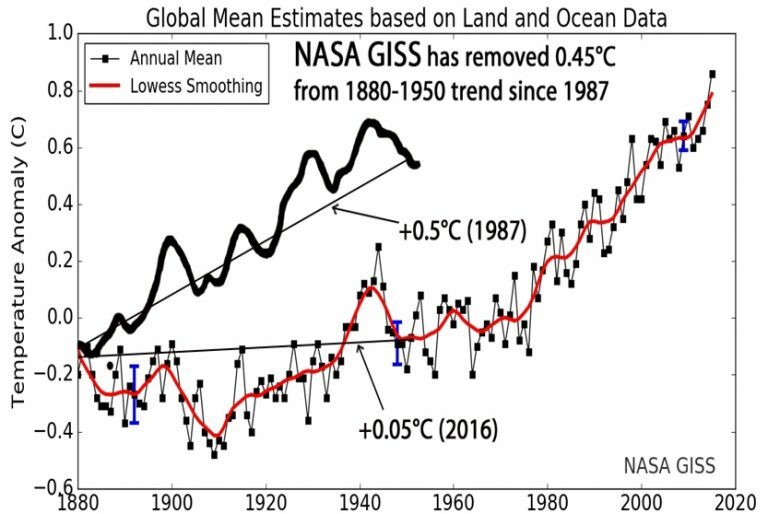 I’m sure this isn’t the last time you will make the 1880 starting point -0.5 C lower for the 1987 graph than for the 2016 graph so as to attempt to make it look like the data wasn’t manipulated. 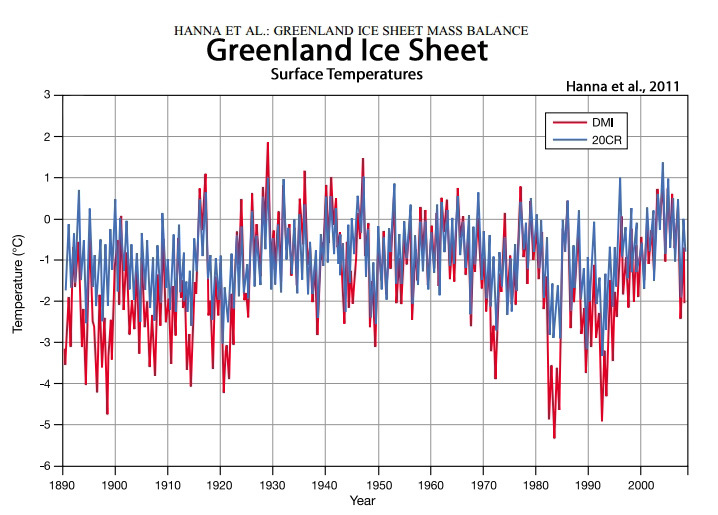 In the process, you have yourself manipulated the data by removing 0.5 C from the 1880-1950 trend, just as NASA did. Thank you for yet again illustrating that you cannot be trusted to honestly disseminate data. Apparently you think you’re “winning” by fabricating. Most people would understand that it’s only hurting your case further. 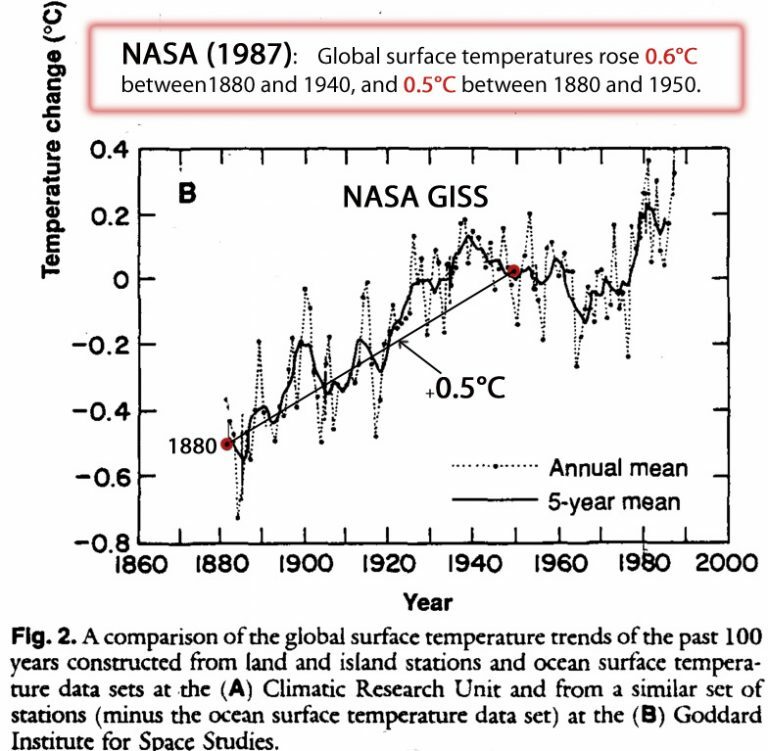 “0.5°C rise between 1880 and 1950” … has been removed by NASA. 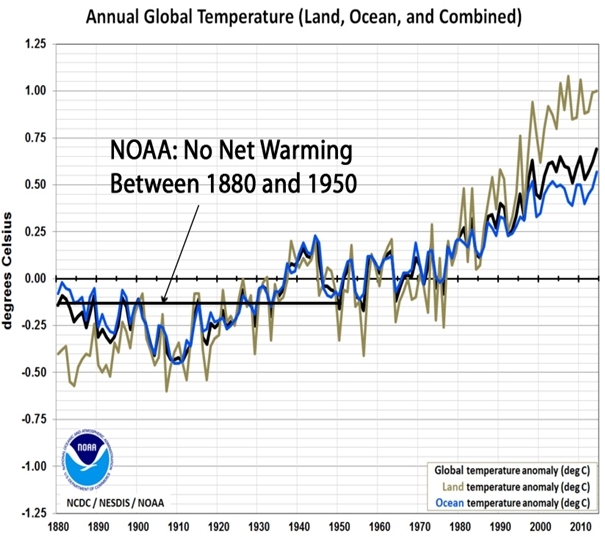 There is now no warming between 1880 and 1950. So you will continue to post graphs that look like this (with the gistemp temperature “clearly” being 0.5 degrees warmer than RSS) instead of this (baseline adjusted)? Just asking to make sure whether or not to trust any of your graphs in the future. It was widely discussed in 1987 that the temperatures had risen by 0.5 C between 1880 and 1950. Now it’s 0.0 C. A half a degree was removed by doing the same sort of data manipulation that you just did. And you want me to acknowledge that your data manipulation is “right”?? Please see Kenneth’s rebuttal comments. How confusing. Does this mean our Climatologists ® don’t really have much forecasting skill or has the Arctic gone rogue? Mr Haddow will be sad. To be fair they have now announced they are not trying to go to the actual north Pole. But just going to the ice edge to see what is there. Something fishermen and whalers have been doing for, probably, millennia. So what’s all the fuss about? Funding and book deals? No, pure science!The gullible rent seeking MSM claim. Look at the 1880 start point,very different. I went to get that chart to discover that they BLOCKED it out at the wayback machine! “McKintyre notified the pair of the bug; Ruedy replied and acknowledged the problem as an “oversight” that would be fixed in the next data refresh. I know this true because I READ what DR. Hansen posted over 15 years ago that he stated that 1934 was barely the warmest year on record. You do realize that what you are complaining here has nothing to do with the GISS time series for global temperature, do you? Sebastian ignores the evidence of what Dr. Hansen said in the past,including that inconvenient chart. You have nothing to counter with or you would have already done it,instead of this deflection. Never once said whether it was regional or global,the point was that Dr. Hansen erases inconvenient charts,even GLOBAL ones,that show a very different picture than the current much warmer ones. Your entire quote is about the U.S. temperature record. You are pathetic as usual. Here is that quote right above your comment,which is indeed US. Annual chart. the next comment finally covers the planet, but since your comment was a pure DEFLECTION to WHY I was posting all these charts,it was your way to avoid the obvious that GISS on regional AND global levels they were changing their charts over time. That they were also deleting some of the PDF’s that contained those charts. Again and again, you fail to post an actual counterpoint my sources comments, just your stupid deflections. My assertions were based on the fact that GISS were over a period of 36 years changing their chart over and over to make it appear warmer than it really is. You are a dishonest person. Every time I reply to you it ends in something that is hard to understand. What are you complaining about? That adjustments improve over time? That old graphs aren’t available on current websites (the world wide web wasn’t around in 1981)? I don’t need a counterpoint … a counterpoint to what exactly? The graphs change because of adjustments being made. You see that as a problem, so compile your own index and see if you can get to a consistent temperature time series without adjustments. You know … GISS isn’t the only temperature time series. Others compile those too from the raw data and the results are pretty similar. Another counterpoint free crap from you,Sebastian. Why don’t you slink away? You NEVER address the obvious point that they keep changing the data and baselines over the years. They eliminated the WELL DOCUMENTED large cooling trend from the 1940’s to the 1970’s,which you have completely ignored. This is pathetic once again. Here is a report on the many DR. Hansen charts in one place,but the links for the posted charts at the NASA website has been deleted,even his own PDF links that contains these charts are deleted. PDF’s! It is clear GISS is hiding their past inconvenient history.You have been shown hard evidence,don’t bother trying to lie about it. Seriously, the raw data is unchanged. Download it and compile your own temperature index. The skeptics true temp index if you will … let’s see if it is better than what scientists all over the world are doing with the available measurements. I think you need a better counterpoint,since you didn’t provide one. It is clear that you can’t answer my use of GISS only charts,to show the obvious changes they made over the years. You are the one who resist the evidence from Dr. Hansen himself. All the while they are deleting even PDF’s of their presentations. But Yonason found one still alive that COMPLETELY supports my narrative. Notice that you IGNORED it,because it doesn’t support your self lies and delusion. You are as usual running on nothing. A counterpoint to what? Your paranoid behavior? What exactly does that support? What are my self-lies and delusions? Have you read the FAQ? https://data.giss.nasa.gov/gistemp/faq/ What points are unclear to you? You keep ignoring serious evidence of repeated changes to the temperature data. I showed you charts, ALL from GISS, showing a clear pattern of data changes,which they do over and over. You have not once addressed my links that shows the evidence,which is why you ignore them to push on a deflection campaign with your links that doesn’t even address my main point at all. GISS over the years from 1981, made a series of data changes,that almost eliminates the well documented cooling trend from the 1940’s to the 1970’s. This is but one example, YOU ignore over and over. Again, where is the problem with all this? You don’t have permission to access /docs/2001/2001_Hansen_etal.pdf on this server. Yes, chatbot_sebh, they are hiding the material. Yes his own PDF’s where the charts came from have been deleted! Going to continue to ignore this,Seb? And then, sunsettommy, there is Hansen’s connection with Soros. note: The Strategic Opportunities Fund includes grants related to Hurricane Katrina ($1,652,841); media policy ($1,060,000); and politicization of science ($720,000). Add it all up, and everything the IBD editorial claimed – that a high-ranking official at NASA may have received money from an organization funded by George Soros in order to politicize science — is actually available in this annual report. Yet, not one media outlet thought this was newsworthy. Here’s another link I just found that has a lot more info on global temps, and the “adjustments” that all seem to make the past colder. What a pathetic attempt to rationalize away the GISS data adjustment. history. 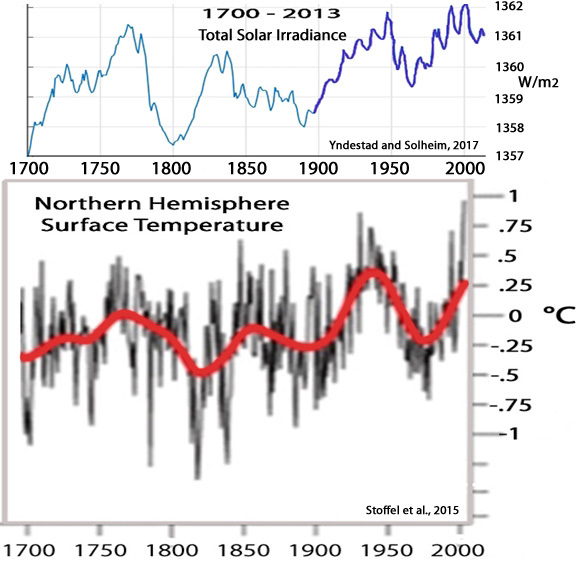 Changing the baseline,eliminate the well known cooling decades long, is not an improvement,it is rewriting history. The RAW data doesn’t change over time, it is the NUMEROUS adjustments that always change. You offer nothing credible here,just evasive bullcrap. Glad you finally realized that the adjustments are subject to change. But you continue to demonstrate that you think this is somehow a bad thing. Very strange. Feel free to improve it with your vision of how the raw data should be adjusted to get a consistent temperature time series. It’s not at all “obvious,” chatbot! What’s obvious is that the warmists are not good people. In fact, looking at the awful things many of them say, we can clearly see just how utterly reprehensible they are. One might even be forgiven for calling them evil. And the misplaced faith the pathetic trolls have in that band of pirates, as well as their zeal in defending them, tells us that they are no better. (The entire PDF no longer exist,just this quote) More evidence of erasing inconvenient excuses for the massive changes. Notice how big the difference is from RAW to final adjustment? The difference is about .55C, which is absurd. You are too stupid to figure it out.as GISS has long been known to be the outlier.It is by far the warmest dataset of the bunch. Do you realize that those datasets have different baselines? Do you know what baselines are? GISS is warming at an INCREASING greater rate over time against HadCrut4 since 1950.